For information on HVNS or any of our activities email. 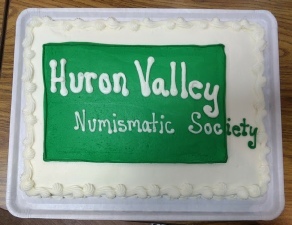 Welcome to Huron Valley Numismatic Society (HVNS), a fast growing coin club. 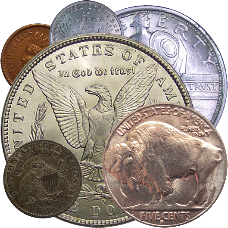 HVNS holds monthly meetings which include: auctions, identification and grading, informational speakers on member suggested numismatic related topics, Show & Tell and numismatic education. We hold March and October Coin Shows, and are partners with PANS for their popular August show. The club believes strongly in the importance of youth and family participation in this fascinating hobby and strives to get kids involved by sponsoring Young Numismatics exhibit awards at MSNS conventions. HVNS conducts community outreach and has completed six general public appraisal events at Highland, Milford and Cromaine/Hartland libraries, sponsored four Scouting merit badge clinics, created the elongated cent heralding Highland Township's 175 anniversary and more. We hope this site suitably serves to inform you about our club, encourage your membership and be an informational tool you can use. Welcome to the Huron Valley Numismatic Society (HVNS) web site! We are a fast growing active coin club. HVNS holds monthly meetings which include: monthly auctions, informational speakers on various numismatic related areas, Show and Tell, and we watch a coin related movie or currently we are working on our grading skills! We hold two public Southeast Michigan Coin Shows per year, one in the Spring, the other in the Fall. The club believes strongly in the importance of youth involvement in the hobby and strives to get kids involved. We hope this site serves suitably to inform you about our club, encourage your membership and be an informational tool that you can use. HVNS sponsors Young Numismatists exhibit award at MSNS conventions, invited to partner with PANS for their August club shows, completed six general public appraisal events at Highland, Milford and Cromaine/Hartland libraries, sponsored four Scouting merit badge clinics, created elongated cent heralding Highland Township's 175 anniversary. I know you are very busy, and don't get enough rest...hayhaps I was not clear.. You missed half of my message. Can you send me the text you removed. The new and old need to be blended. I will do that, just need the previous statements. Box is gone, Off to Warren here, will update again later this afternoon. I don't mean to be picky, but a little more info is needed to smooth this text out.....can you send me the previous copy, please, and I will do it. Jim, here is what I can think of, just delete the stale info and add this. I tried to copy and paste. You have the key to open the site and make additions and changes. A local club has coined a symbol of Highland Township's history — literally. Click here for ordering details.